All people are different and they love to perform different workouts. Some people like to workout their legs and buttocks by performing squats and lunges, other people enjoy performing cardio training routines to accelerate fat burning. For others, ab day is the most important day of the week. But if your training regimen does not include an arm workout, then you are in big trouble. 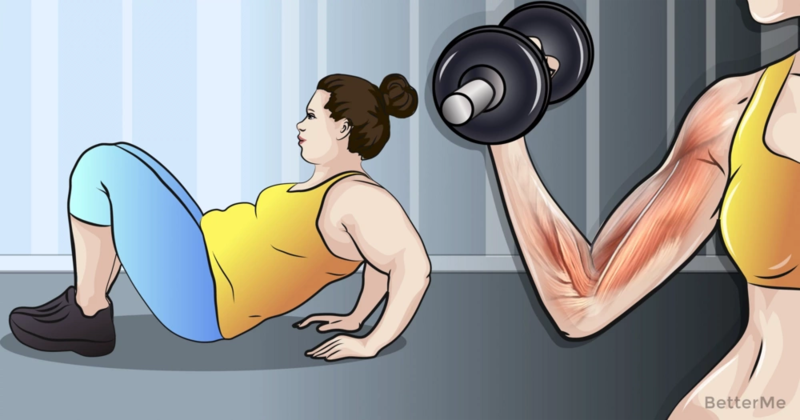 It is important to train your upper body in order to prevent flabby jiggly arms. Strong toned arms not only look amazing but upper body strength is crucial to staying healthy, fit and good-looking as you age. Moreover, you feel comfortable wearing any clothes, if you have sculpted toned arms. It sounds great, doesn't it? We would like to show you several arm moves to make your biceps work. This ten-minute bicep-workout consists of easy and effective moves such as bicep curls, hammer curls, push-up punches, tricep overhead extensions and tricep dips. It focuses on strengthening your triceps, shoulders and chest muscles and it can increase strength in your arms. Are you short of time? This training routine can be easily performed at home as you need only a set of light dumbbells and a timer. In order to obtain amazing results, you need to perform this workout three times a week combining it with cardio routines to build a beautiful body and strong, well-defined arms. Scroll down to see how to do these moves correctly in order to avoid injuries. It is time to flash those guns, ladies!